Adding to a slowly growing set of value-added services, Twitter on Wednesday activated live 360-degree video streaming capabilities through its subsidiary Periscope, an interactive feature that puts viewers in the middle of the action. With the new feature rolling out today, users can view and interact with live 360-degree footage directly in the Twitter or Periscope apps. According to a blog entry from Twitter, 360 video live streaming is currently limited to "select partners" like internet celebrities, but plans are to bring the feature to a wider audience in the near future. 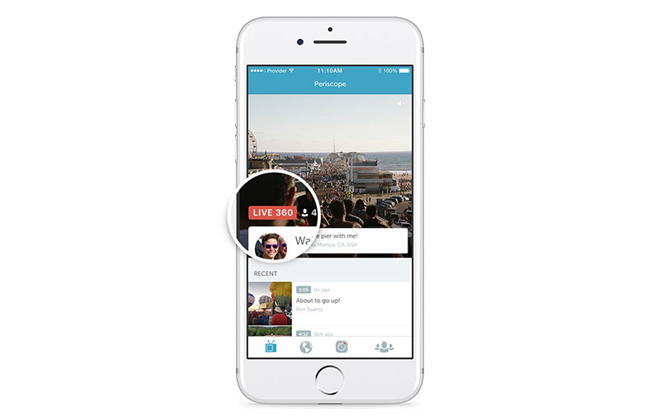 Periscope in its own blog post said 360 video will see a broad rollout in the "coming weeks." The new 360-degree video service operates in similar fashion to systems already in use by YouTube and Facebook. When a red "LIVE 360" badge appears at the bottom left of a video post users can swipe to pan —with minimal leeway for vertical tilt —around a scene to get a better look at on-site surroundings. On a laptop or desktop, scrolling is accomplished via a click-and-drag mouse gesture. As seen in the embedded post from Periscope influencer Alex Pettitt, 360 videos can be saved for later consumption. On the backend, Periscope baked in native integration with the $200 Insta360 Nano camera, a dual-lens device that plugs directly into an iPhone's Lightning port. The camera is compatible with iPhone 6 and iPhone 7 series handsets, suggesting Apple's handset is —for now —required to produce 360-degree content. Periscope is looking to broaden support, however, and is asking users who to experiment with their own hardware through the Periscope Producer program. Those interested in creating 360 videos when the service rolls out beyond the initial set of broadcasters can apply for access on Periscope's website.